"Barely tall enough to peer over his notes and lectern, Doug, or Professor Martin in those days, drilled us relentlessly on the basics of newspaper reporting. 'Damn it, write short sentences,' he would say. "On layout nights, Doug roamed about the room like a managing editor of the Detroit Free Press, which he had been while leading the paper to a Pulitzer Prize. "Thank heaven, Doug came out West, brought all that experience with him and shared it with a bunch of idealistic students." • Alumna remembers Doug Martin in 2003 Cursor. 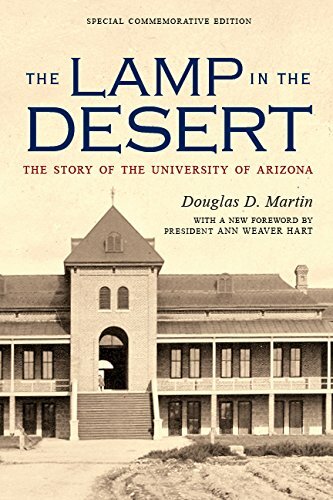 "With six teachers, no books, and 32 students, Old Main opened its doors to the first pupils of the University of Arizona in 1891. A rugged beacon among the cacti, the campus emerged from a 40-acre donation from two gamblers and a saloonkeeper." Professor Douglas D. Martin never stayed retired and never stopped following his passions: newsroom journalism, education and recording the history of the Southwest. A native of Benton Harbor in Michigan, he started his journalism career as a typesetter at age 15. He worked at newspapers in Michigan, Arkansas and Indiana, followed by a career at the Detroit Free Press. He won two Pulitzer Prizes at the Free Press: In 1932, he shared the award for reporting; in 1945, he was managing editor when the Free Press won for Public Service. As managing editor of the Free Press in 1945, Martin decided to retire and move to Tucson for his health. Soon he caught the attention of the University of Arizona, which hired him to develop and start the UA Journalism Department in 1951. “No person made greater contributions to the University of Arizona and to the State of Arizona than Douglas D. Martin,” former UA President Richard A. Harvill said after Martin, 78, died in 1963. Martin initiated the school’s John Peter and Anna Catherine Zenger Freedom of the Press Award, which has been given to the nation’s top journalists who fight for press freedom and the people’s right to know since 1954. Past winners include Walter Cronkite and Katharine Graham. Before his second retirement — from the UA in 1956 — Martin’s third career as an author and historian was already well-established. His three major books were broadly acclaimed: “Yuma Crossing,” “Tombstone’s Epitaph,” and “The Lamp in the Desert.” Each is a treasure, written with the skills of a historian and the economy of words of a journalist. I had the good fortune to take an honors course from him in his third-floor office of the original UA Library Building. He shared that office with Dr. Bernard “Bunny” Fontana. Professor Martin insisted that they arrange their desks facing each other, as in a newsroom. “Thank heaven, Doug came out West, brought all that experience with him and shared it with a bunch of idealistic students,” said the late Hugh Harelson, a 1954 graduate and student of Martin’s.